Sharing your thoughts with others can have wonderful results - but you've got to share first. As a result of my writing in this sphere, David Ramos approached me to review his Climbing With Abraham on Abraham. In his initial email, he said, "My name is David Ramos. I am searching for reviewers who might be interested in reading a Christian devotional based on the life of Abraham and came across your blog because you have a similar approach to studying Scripture." Flattered was an understatement. He read my blog, liked my style and saw that I wrote about things similar to what he captured in his book. So I eagerly embarked on this journey. 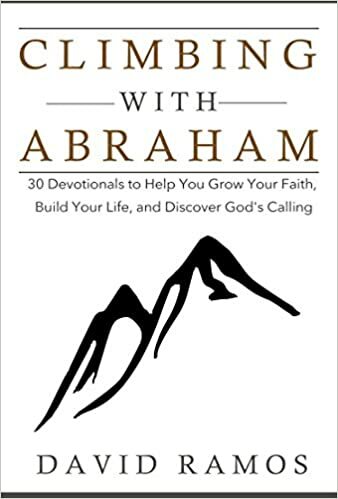 Since Climbing with Abraham is a 30-day devotional - I read and meditated on it during the month of December. As a reader and a writer, his writing styled resonated with me - it was simple, yet profound. More importantly, I got a new appreciation for the life of Abraham. Abraham had a beginning - at the beginning of the story of Abraham, the Bible lists his descendants. Before we were, we came from somewhere. Our beginnings impact who we can become and our story begins long before we do. Our story is part of something infinitely larger. Abraham made mistakes - God's patience and sovereignty are more powerful than our stumbles. Abraham chose to believe - Therefore his faith impacted the faith of others he interacted with. The consequences of our faith do not just fall on us, but also onto our mates, our children, or our employees. Abraham, throughout his story, acted on what he believed. Abraham's wife, Sarah was his constant companion - by our accounts, it would not appear that it was a perfect marriage; twice Abraham was willing to give Sarah away, and Sarah let her maid sleep with Abraham. As a couple they made mistakes but they were faithful to God and faithful to each other. Their blessings superseded their mistakes. In her death, he honored her for being there with him through thick and thin. God's timing can baffle us - the story of Abraham reminds us that God’s plans are always incomprehensibly larger than our own. Abraham was frustrated along the way but held out hope on what was promised to him. Humans get frustrated because we don't understand God's ways. Nothing is too difficult for God - In Abraham's life, Sarah gave birth to Isaac at 90. In my life, I've seen it and some of it I've shared here on this blog, my late in life child (she was an answer to pray of one of her siblings), and my lost and found stories - to name a few. Finally, an excerpt from the author: "Sometimes following God’s will looks exactly like normal life. Making choices without knowing which one is correct, dealing with personalities and circumstances to find a suitable outcome, and just trying and praying and letting things fall where they will. The Christian life is, for the most part, not supernatural. What Christ and the Holy Spirit did and do is certainly beyond this world. But on our part, most of what we do will be classified as normal. Normal prayers, normal errands, normal difficulties and frustrations, and normal successes. It’s God who takes the normal and turns it into supernatural." As you start another year, take some time to meditate on Who controls your life. If you don't know, a devotional like this may be a good place to start. If you've become stagnant in your Christian walk, re-read the story of Abraham, a mere man who chose to believe the promises of God. Perhaps his life will help you to change your perspective also.